PBS-T buffer contains the non-ionic detergent Tween TM 20 which acts through blocking. It has the ability to reduce non-specific binding and protein-protein interaction during the wash step in protein and immunoassay procedures such as ELISA and Western blotting. Decreasing the non-specific binding and staining makes ELISA results and blots easier to interpret. 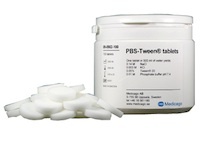 Medicago’s PBS-T buffer is supplied as exactly pre-weighed tablets in bottles and in convenient blister packs. Final buffer volumes range from 100 ml to 1000 ml. One tablet dissolved in deionized water yields a 0.14 M sodium chloride 0.0027 M potassium chloride, 0.05 % TweenTM 20, 0.01 M phosphate buffer with pH 7.4 at 25°C. Deposit one tablet in a laboratory flask or beaker placed on a magnetic stirrer. Add 50 ml to 300 ml of deionized water and stir the solution for a few minutes. Adjust up to the given final buffer volume, stir until full dissolution and the buffer is ready to use. PBS-T buffer is shipped at room temperature. Store the product in a dry place at room temperature. Shelf life is three years after production date.